SINGAPORE - After deciding he had enough of waiting 30 minutes for his wonton mee, a man started smashing the stall front with a beer bottle. The incident happened at North Bridge Road Food Centre on Monday (Oct 31) at about 10.30pm. A woman selling soya beancurd at a nearby stall tried to prevent the man from escaping, but received a beating instead. 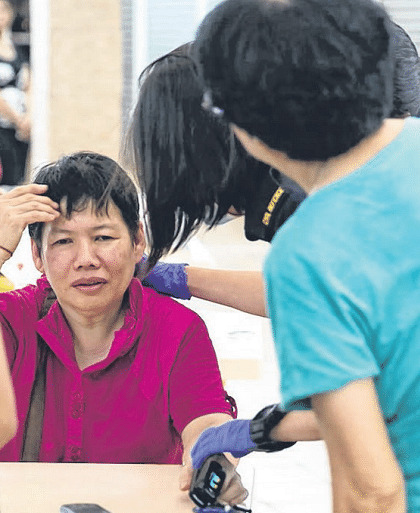 The owner of the wanton mee stall, Ms Ye, 65, told Chinese newspaper Shin Min Daily News that she had opened the stall as usual last night when the man came to order a takeaway meal. He grew impatient after waiting for about 30 minutes and walked towards the stall in a huff. He reportedly shouted at Ms Ye: "Do you want to give me my wonton mee? If not I will show you! (sic)"
As Ms Ye replied that there were still two customers ahead of him, the man took a beer bottle and smashed the glass display at the front of the stall, causing it to shatter. Ms Ye told Shin Min: "As I could smell alcohol on him, I immediately called the police. When he tried to leave later, I followed him and tried to prevent him from escaping." The soya bean stallholder noticed that something was amiss and followed them. When the man struck an aggressive pose, she tried to mediate but became the target of his wrath. The man was believed to have punched the soya bean seller on the face and hit her again after she fell to the ground. Shin Min reported that the woman felt giddy and her face was swollen after the attack. The Singapore Civil Defence Force (SCDF) confirmed that they were alerted to a case of ambulance assistance at 11.04pm and sent an ambulance to the location. A person was conveyed to Tan Tock Seng Hospital. The police said that they were alerted to a case of rash act at the area at 10.42pm on Oct 31. A 54-year-old man was arrested in relation to the case and investigations are ongoing. It is understood the man was arrested near the location of the incident. Shin Min reported that the victim of the attack was discharged from hospital on Tuesday (Nov 1) morning. She had been in the emergency department through the night, and while her face remained slightly swollen, she was alright, her daughter told Shin Min.